Warm. Very crunchy sounding cover though. Have had many down comforters. First one to make so much noise. Hoping subsides with time. Keep cool and comfortable with this down comforter by Beautyrest. 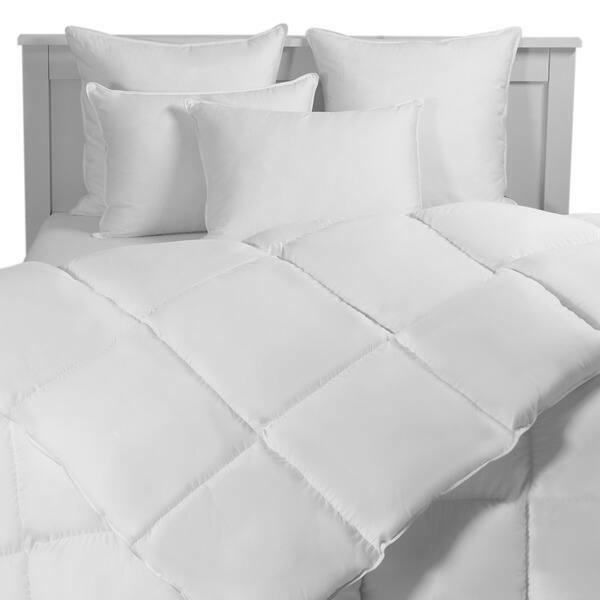 This comforter features a 233-thread count, 100-percent cotton cover and is brimming with luxuriously cool Arctic Fresh Down, which provides breathable warth for every season. Sleep comfortably every night, during every season. For your convenience, this comforter is machine washable and dryable. Twin: 68 inches wide x 86 inches long / 20 oz. Full/ Queen: 90 inches wide x 90 inches long / 27 oz. King: 106 inches wide x 90 inches long / 32 oz. It looks a little fluffier in the picture. But still not disappointed with this comforter. Still fluffy and warm loving it on these cold nights here in New Mexico. No feathers coming out real good quality . Beauty rest makes good bedding I own a beauty rest mattress and beauty rest pillow and now comforter. I would recommend this to anyone. Easy to clean. Nice and warm. "Does this duvet have corner tabs (for securing duvet cover)? Thank you." "Can you tell me what the percentage of down is in the fill? Also, does the comforter make crinkly sounds?"